Do you enjoy eating at buffets? Maybe you do. Or maybe you don’t but your partner or best friend does! 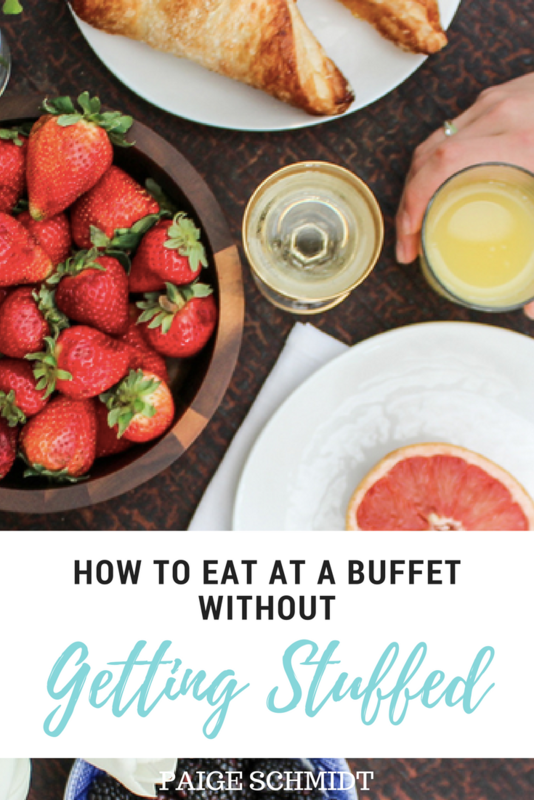 Today’s post is all about how you can eat intuitively at a buffet so you can walk away feeling good and not stuffed (we all know the feeling of “food coma” too well). It’s my dream that we’d feel more permission and trust around food so it can take up less space in our minds and we can have clear consciences to focus on OTHER things, like our relationships, careers, families, friends, our hobbies, etc. It is my goal with my clients to help them realize that they can truly have all foods (unless they have a legitimate allergy) in moderation and walk away feeling good. Here’s a personal example: If I eat five bowls of ice cream, am I going to feel good? No. On the other hand, if I can learn to calmly savor one small bowl of ice cream, enjoying every bite with gusto, will I feel good? YES. I will feel totally fine. I’ll be nourished and happy. I’ll feel satisfied, since ice cream was exactly what I was craving. I’ll walk away confident, knowing that I can trust myself with food. And I’ll be able to move on to the next thing in my life that I want to give my attention to. I’ll have thoughts like “Wow, I CAN have ice cream and still feel good when I’m finished.” What a good feeling. It’s when we create MORE of these experiences that we can do things like walk into a buffet confidently, knowing that we’re there to eat a meal, enjoy others company, and try our most favorite foods without getting so stuffed that we feel sick. So let’s talk about how! Before you head to the buffet, I want you to picture yourself walking out the exit doors with that “Ah, I feel totally fine. Comfortably full. I tried what I wanted, but I didn’t overdo it” thought. How satisfying does that feel? Tell me what that’s like? It’s so important to visualize the positive effects of slowing down and eating mindfully versus thinking about and stressing over the consequences you will feel if you stuff yourself full. What we think about, we bring about. Remember that, and begin to visualize feeling satisfied and confident walking out those doors. When you get to the buffet, do a once over. Even if that means going through the line twice. Don’t worry about what other people think. Your goal is to feel good. You’re there to enjoy your experience. If that means a couple funny looks, so be it. Walk through the buffet and glance around at what’s available. What sounds good? I practice this when I’m at the Whole Foods buffet too – you can do it anywhere. What looks good? What do you really want to try? Now that you’ve scanned the buffet, grab a plate and begin to fill it with the things that look wonderful to you. Since we’re at a buffet and we’re likely going to be choosing a handful (more or less) of options, consider that you’re tasting each food. So rather than saying “pizza looks good!” and getting the three slices you might normally eat, grab one slice. We’re leaving room for everything else that sounds good. A personal example: When I’m at a buffet I love tasting the mac n’ cheese. However, if I were to eat a huge bowl of mac n’ cheese, I wouldn’t feel good. Rather, if I get a taste of it (just a smallish spoonful) along with several other things that sound amazing I’m going to feel satisfied (I got the flavor of what I wanted!) and good in my body (I didn’t eat so much that it made me sick). Eat a little slower than you normally would so that you can let each of the flavors melt in your mouth. You’re literally soaking up the flavor of the food with your tongue. Sound silly? It’s so worth it. When you can learn to TASTE your food you’re going to learn to appreciate good tasting food so much more. This is not your only buffet, my friend. You’ve got to have the mindset that you can literally come back to a buffet anytime you want. Or you can make that mac n’ cheese at home, anytime you want. I like to use the example of Thanksgiving. So often we think “but Thanksgiving food only comes around once per year so I must eat it now because I love it!” Well, that’s only because we’ve set it up like that, right? Can’t you make mashed potatoes anytime? Green bean casserole? Turkey? Yes, I thought so. Remember that you can have this food anytime you want it again. There’s no need to get it all in now. Remember, you eat foods you love and have NO rules. More delicious food is in your near future, the very next time you’re hungry. There’s no need to overkill the satisfaction now. Spread it out. Get yourself calm, and remember there are many other things to enjoy in life than just food. What else are you looking forward to? Think about these things. Remember that visualization you did in the beginning of how good it’s going to feel to walk out those exit doors feeling good? Now that you’re nearing the end of your meal and you’re starting to feel that comfortably full, satisfied, if I keep eating I’ll probably feel too full feeling… remember that you want to feel good. What else are you looking forward to today? What do you want to feel good for? The ride home? Your evening? Seeing friends? Being cozy in your PJ’s, watching Netflix, and sipping your favorite tea? What’s your motivation to feel good? This is a great time to remember it so that you choose FEELING GOOD over more food. Also, at this point, when you’re starting to get full, the food will no longer taste as good as it did when you first started. Even more reason to wait until your next meal. If you go back for more, the food won’t be as enjoyable. You’ve already reached that peak pleasure point and the flavor is downhill from here. Better to wait until you can truly enjoy wonderful flavor again, the next time you start to get hungry! I hope this post was helpful! Let me know your thoughts and share your questions with me below in the comments. I would love to hear. P.S. I have FIVE open spaces on my calendar next week for you to book a Discovery Session with me if you read this page and would like to work together. I’d also encourage you to read these stories of women who have worked with me before, to see if you resonate. If you do, I’d love to support you. Book a time to talk here. Next Post: VIP Q+A: 5 Questions You Might Have if Intuitive Eating is New to You Previous Post: Is Getting “Thin” Going to Make You Happy?